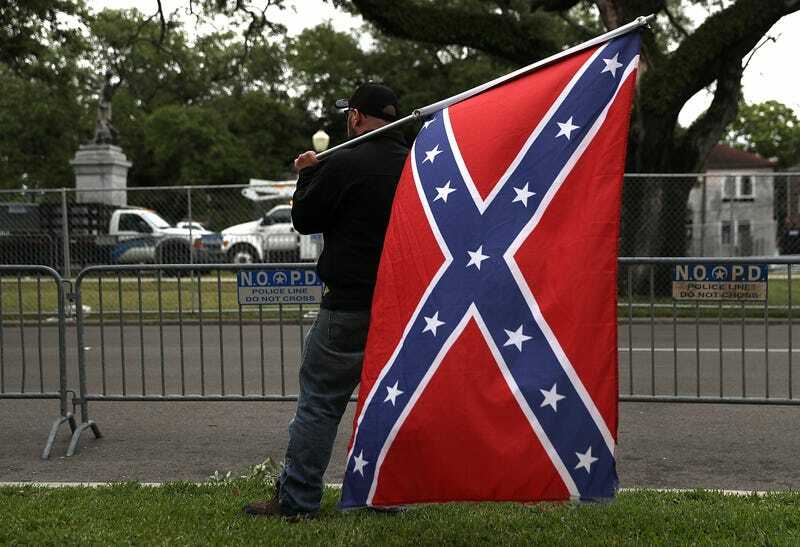 On Monday the Louisiana House of Representatives held a vote on the city of New Orleans’ removal of monuments to the Confederate States of America, The Advocate reports. After two hours of furious debate, the House overwhelmingly voted 65-31 for H.B. 71, which forbids the altering, removal or renaming of any “structure, plaque, monument or statue” related to the Civil War. This is what white supremacy looks like. The bill, which now moves to a state Senate vote, does not specifically mention the Civil War or the anti-American efforts to withdraw from the United States. (Yes, by definition, no advocates of the Confederacy can call themselves “American.” It’s as stupid as if the Founding Fathers who wrote the Declaration of Independence had referred to themselves as “Englishmen.”) This is because—in an effort to whitewash the history agreed upon by historians, professors, almost every academic entity in the world and the actual words in every single state’s declarations of secession—the Louisiana Legislature does not admit that the Civil War was about slavery. The words “Civil War” don’t even appear in the legislation, because the phrase invokes the reality that their ancestors fought and died for the idea that whites should be able to keep human beings as their property. There is no debate about this. Unless the Legislature has secret evidence that every historical document pertaining to the Civil War is a forgery, the sentence “The Civil War was about slavery” is a historical fact. But apparently, Louisiana lawmakers have endowed themselves with the prerogative to change the past and erase the truth. The whitewashers of history who promote the idea that the Civil War was about states’ rights (they conveniently leave out the rest of the sentence: “ ... to own slaves”) contend that local populations should have the right to make their own rules based on local values. Yet they curiously ignore the fact that the New Orleans City Council, elected by their constituents, voted to remove the monuments. They conveniently overlook the detail that New Orleans is a majority-black city, and blacks are the taxpayers who pay for the upkeep of the monuments to white supremacy. To the white legislators, the wishes of the community matter—except its black members. In the hullabaloo surrounding the monuments, very few news outlets—if any— have definitively reported why these landmarks are embroiled in controversy. It is not because of feelings or emotions. The reasons that these memorials are considered vestiges of white supremacy are based on historical fact and verifiable sources. The Battle of Liberty Place was not fought during the Civil War. In fact, the battle was fought nine years after the Southern states’ traitors were roach-stomped into submission. In 1873 the Crescent City White League, upset that blacks were allowed to vote in the election, killed 150 black citizens in the Colfax Massacre. In 1874 the White League formed a paramilitary arm and tried to overtake the local government, which it considered to have been illegitimately elected by blacks. The league members attacked the police and state militia and were defeated in the Battle of Liberty Place. McEnery and Penn having been elected governor and lieutenant-governor by the white people, were duly installed by this overthrow of carpetbag government, ousting the usurpers, Governor Kellogg (white) and Lieutenant-Governor Antoine (colored). United States troops took over the state government and reinstated the usurpers but the national election of November 1876 recognized white supremacy in the South and gave us our state. The statue was funded by the Jefferson Davis Memorial Association, whose membership required only that the person be a “white person” of good moral character. When the statue was dedicated in 1911, it was in front of a “whites only” crowd. P.G.T. Beauregard created the American symbol of white supremacy. This is why the black citizens of New Orleans want these landmarks destroyed. The people who oppose their removal are not arguing for history. None of the white history advocates have shown up to the protests with armfuls of history books and pamphlets. Most of them don’t even live in New Orleans. The people defending the monuments hold the same beliefs as the the 65 Louisiana legislators who overruled the will of the people who have to walk past, look at and pay tax dollars to maintain the legacies of figures who believed that black people were subhuman chattel whose worth was somewhere between the lowest Caucasian and a decent plowing mule. That’s what white supremacy looks like.